Since opening in 1995, Greg May Honda has maintained our solid commitment to our customers, offering a wide selection of Honda's and ease of purchase. 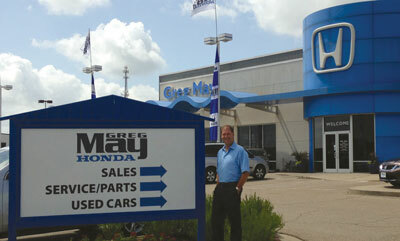 Greg May Honda's service department strives for 100% customer satisfaction. From general maintenance such as oil changes to major repairs, let Greg May Honda service your vehicle. Our commitment to customer service is second to none. We offer one of the most comprehensive parts and service department in the automotive industry. Manufacturer recommended parts are an important part of maintaining your vehicle's optimum performance. At Greg May Honda, we offer the same high quality parts your vehicle was built with, and we keep a large inventory of OEM certified parts in stock at our facility. We created our website to act as an online, virtual dealership for the sole purpose of helping you find what you're looking for quickly and painlessly. We are your one-stop shop for everything Honda in Central Texas. If you have any questions, please feel free to contact us.